The Royal Dutch Mint have launched their annual Uncirculated 2012 year set, which includes each denomination for the circulation coins issued in the Netherlands. This year’s theme celebrates the 10th wedding anniversary of TRH Crown Prince Willem-Alexander and Crown Princess Maxima who were married in a stately and moving ceremony on the 2nd February 2002. Crown Prince Willem-Alexander is the eldest son of HM Queen Beatrix, Dutch head of State since 1980. The Bride, formerly Miss Maxima Zorreguieta was born in Buenos Aires, Argentina and met her future Husband while both attended the Seville Spring Fair in April 1999. Maxima once worked for an International Finance institution in New York as an investment banker / analyst. The ceremony, televised in the Be-Ne-Lux countries and in Argentina, (home of the Bride) was one of the most watched events in the region. Their first child, Princess Catharina-Amelia was born in December 2003. The new set includes a special commemorative medal struck in sterling silver as well as all circulating EURO coins, the €2 down to the 1euro-cent. The medal depicts the Royal Couple on the day as they were standing at the altar which is seen on the obverse. 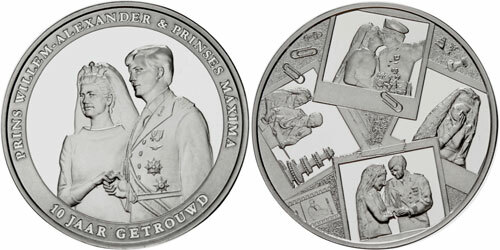 The text “PRINS WILLEM-ALEXANDER & PRINSES MAXIMA” is placed around and above the primary design. 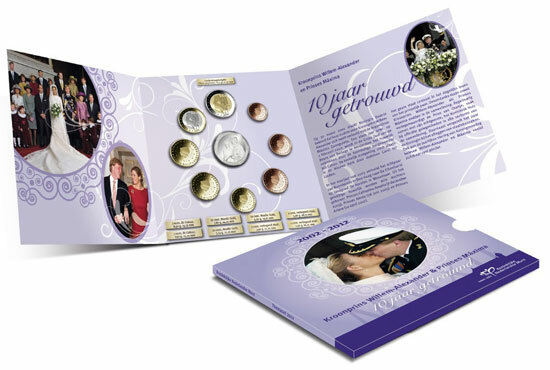 The additional text “10 JAAR GETROUWD” is placed under the design. The reverse is cleverly designed as it contains images from some actual photos which were particularly moving during the ceremony and images after the service and reception. They are randomly arranged with four specific images featured. The medal weighs 16.4 grams and has a diameter of 30 mm. A total of 5,000 sets have been authorized. For more information on this and other coins & sets offered by the Royal Dutch Mint, please visit their website at: http://www.knm.nl/Themaset-2012/nl/product/2862/ The information is in Dutch – International orders fulfilled.